St Gemma and Father Cajetan C.P. 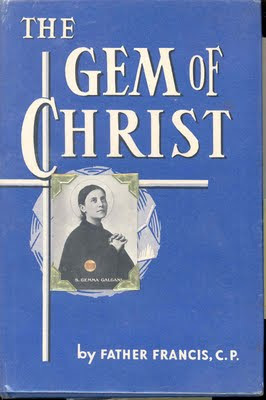 Those who have read Gemma’s Autobiography will recall how in the summer of 1899, only a few months after her miraculous cure and right after she had just received the holy Stigmata, Gemma took part in a Mission that was being preached by three Passionist Priests in the Cathedral of St Martin. During this time, she went to Confession to one of the Priests, named Father Cajetan. While prayer a few moments before her confession, Jesus in an interior locution, ordered her to reveal everything in Confession –“everything” meaning the Stigmata and the other mystical experiences and graces, along with her faults. ‘Jesus, by order of my Confessor, I recommend to Thee my great­est enemy, my greatest adversary. Guide him and if Thy hand must be laid heavily on him, press it on me instead. Give him every grace, Jesus. Do not abandon, but console him. What does it matter if you leave me in pain? But do not let him suffer. I recommend him to Thee now and always. Confer on him many blessings, twice as many as the harm he would like to do me. And to show that I love Thee, I will offer Holy Com­munion for him tomorrow. He will perhaps be thinking of doing us some harm, but We desire to do him every possible good’. When Gemma was restored to health, she returned these visits of her friend, who, though pleased to engage in holy conversation with the saintly girl, declared that she always felt unworthy of receiving her. To love one's friend in God and to find in that love an incentive to greater holiness is Christian friendship. To pray for sinners, to wrestle with God for their salvation is Christian zeal. To forgive injuries, to pray for those who persecute and calumniate is Christian charity. But to re­ceive a sinner into intimate friendship is Christ­like, for only the innocent, the humble, the loving can do it. In the voluminous pages of the Pro­cesses there is a little story told by a witness who was Gemma's friend. It had nothing to do with ecstasies or the size and shape of the Stig­mata; nor is it an impressive prophecy of an important event. What did she care for matters that took Gemma away from her, for things that enemies scoffed at, for questions that theo­logians disputed? "Next, reading Tecla Natali's testimony, one is immediately apprised of her own enthusiastic love for her holy friend [Gemma] but at the same time one may detect a certain holy envy for another, quite different from herself, who was more favored by the Saint. Tecla Natali states-"
“She possessed such childlike purity that it never entered her mind to think of the sinister or impure interpretations people might read into her inno­cent actions. A Passionist lay brother enjoyed telling of the time she asked to accompany him to the Mission at Santo Concordio. When he ob­served that it would not look right for him, dressed as he was in the religious habit, to walk on the public streets with her, she exclaimed: "Oh cursed human respect!" [Gemma it seems, thought that because of his statement, the good brother was embarassed to be seen with her, when in reality the Brother was referring to a situation that could mistakingly be a cause for scandal amongst those who may see them innocently walking together] Another time she asked if she might walk to the monastery with him ­six miles out in the country. The good brother found an ancient excuse the only escape from her naive request: "What will the Provincial say to me!" And Jesus said rather severely : "My child, it is Your Jesus that says this and that should be enough." 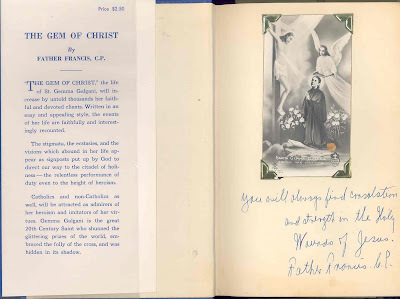 The relic of a Saint so dear to her was a large one and a gift from Father Germano. When some nuns had asked to borrow it, she had cried on parting with it. 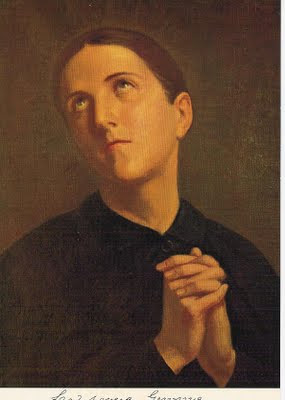 For this Our Lord had rebuked her and, recognizing her attachment, she gave it to Cecilia Giannini. "Thus I passed it off when my aunt questioned me, which happened twice. I went to confession and with a great effort revealed absolutely every­thing. It is he, the Confessor, who has ordered me to write at once to find out what is to be done. Command me, Father; forgive me. I will put the picture back. In this matter, Father, I have no wish to displease God, nor you nor anyone else. You won't doubt this? Please write soon. Click here to go to Part 2 of the "Little stories in the life of St Gemma". I enjoyed reading these accounts, especially the first one concerning Fr. Cajetan. Certainly, this story is a good inspiration for all of us to pray for our enemies and offer up our suffering on their behalf. Our dear St. Gemma is a good example of humility and obedience for all of us. I am really glad to hear that you enjoyed the article and I sincerely thank you for your comments. As I mentioned at the beginning of the article, I will soon be publishing more of these little inspiring stories of St Gemma in Part 2. May God bless you and draw you ever closer to Himself!